The Midnight Blue Collection of white plates and bowls with a geometric blue and gold rim is a mix of sophistication and modern. They are an excellent choice in plastic dinnerware and perfect for your special occasion. These disposable plates for weddings are the pinnacle of class and youthful exuberance. You'll love the look for your wedding reception or rehearsal dinner. 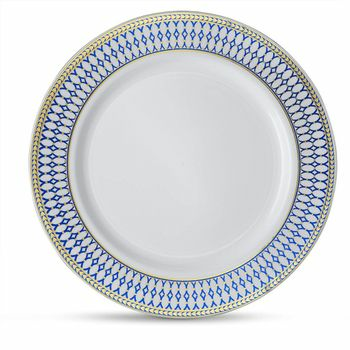 Midnight Blue White w/ Blue and Gold Border 10" Plastic Banquet Plates, 10ct. Midnight Blue White w/ Blue and Gold Border 9" Plastic Luncheon Plates, 10ct. Midnight Blue White w/ Blue and Gold Border 7" Plastic Salad Plates, 10ct. Midnight Blue White w/ Blue and Gold Border 6" Plastic Dessert Plates, 10ct.